Chagdud Tulku Rinpoche (Tib. ལྕགས་མདུད་སྤྲུལ་སྐུ་, Wyl. lcags mdud sprul sku) (1930-2002), Padma Gargyi Wangchuk, was a renowned teacher of the Nyingma school. He was known and respected in the West for his teachings, and also for his melodic chanting voice, his artistry as a sculptor and painter, his limitless compassion, and his sense of humour. He was the source of treasured Nyingma lineage transmissions for the thousands of people whom he taught in North and South America, Asia, Australia, and Europe. Chagdud Tulku Rinpoche was the fourteenth recognized Chagdud incarnation; and his root incarnation was Gyalwa Chokyang. Chagdud means 'iron knot', and is said to derive from one Sherab Gyaltsen, the first Chagdud incarnation, who folded an iron sword into a knot with his bare hands. This feat deeply impressed the emperor of Mongolia and inspired him to shower honours on Chagdud. Chagdud Tulku Rinpoche demonstrated the same extraordinary power several times in his youth when he compressed stout swords into folds. He was born in the Tromtar region of Kham eastern Tibet in 1930. His father was Sera Kharpo, who was actually a lama in the Gelugpa school. His mother was Delog Dawa Drolma, who was widely considered to be an emanation of Tara, and had a profound influence on her son's spiritual life. After this retreat he received numerous teachings, empowerments, and oral transmissions, from various spiritual masters, including Shechen Kongtrul, the Sixth Shechen Rabjam, Bathur Khenpo Thubga, Jamyang Khyentse Chökyi Lodrö, Arik Rinpoche and Tromge Trungpa Rinpoche, who told him that Tara meditation would be a primary source of accomplishment in his life. In 1945 shortly after completing his first three year retreat he went to see Jamyang Khyentse Chökyi Lodrö. From Chökyi Lodrö Rinpoche he received the Rinchen Tangyud empowerments, and caught his first glimpse of Dilgo Khyentse Rinpoche, who was attending the empowerments. By 1946 he entered his second three year retreat, this time under the guidance of the Tromge Trungpa Rinpoche. Near the conclusion of this retreat, the death of Tromge Trungpa forced him to leave before its completion. He then returned to Chagdud Gonpa in Nyarong, and after staying there for awhile, proceeded on a pilgrimage to Lhasa with an entourage of monks. He then did an extended retreat at Samye, the monastery built by Guru Padmasambhava, and afterwards attended empowerments given by Dudjom Rinpoche, who would become a main teacher as well as a source of spiritual inspiration for him. After this in 1957 he stayed for a year in Lhasa, Tibet, in the same household as Polu Khenpo Dorje, whom he regarded as his root lama. During 1958, his last year in Tibet, Chagdud Tulku was advised to marry in order that he would have a companion and helper in the unsettled times to come. He later wed Karma Drolma, the daughter of a wealthy landowner in Kongpo. Later on in exile in India, they would have a son and a daughter, Jigme Tromge Rinpoche and Dawa Lhamo Tromge. Following Tibet's invasion by China in 1959, Chagdud Tulku escaped along with Polu Khenpo Dorje to India, after enduring hunger, and many close calls, where it looked like they would not make it out. His route took him through Pemakö region of Tibet, and his party came out from there into the Nagaland area of India. In India Rinpoche lived in a number of Tibetan refugee resettlement camps─Kalimpong, Orissa, Dalhousie, Bir, and Delhi. He practiced Tibetan medicine, and was much in demand as his fellow refugees had trouble coping with the heat, and subtropical diseases found in India. A year or two after his arrival in India, Rinpoche entered a retreat in Tso Pema, a lake sacred to Guru Rinpoche, located near the city of Mandi in Himachal Pradesh. At this location he met Changchub Dorje, a primary disciple of Apang Tertön and a lineage holder of this great treasure revealer's Red Tara cycle. Changchub Dorje gave him empowerments for the Red Tara cycle, and then he re-entered into retreat and signs of accomplishment in the practices came very swiftly. Later, when he began teaching in the West, Red Tara sadhana would become the meditation most extensively practiced by his Western students. While he was living in Bir, circumstances there gradually led to an estrangement with Karma Drolma, and eventually they separated. After giving a teaching in Kulu Manali, the Dalai Lama extended an invitation for Rinpoche to go to the United States and teach, contingent upon him getting a visa. It was at this time that he moved to Delhi, and lived in Majnukatilla, a Tibetan Camp on the banks of the Jamuna river. The process of trying to get a visa went on for three years, and was ultimately unsuccessful. During this time period he met his first Western students, but he also caught malaria and nearly died, and was saved by an Indian doctor who finally made the correct diagnosis of what was ailing him. While attending them Chagdud Tulku met an older lama from Western Tibet, Lama Ladakh Nono, who was known for doing mirror divinations. He subsequently did a mirror divination for Chagdud and told him he should go to the West and benefit many people there by teaching the Dharma. He also predicted that a Western woman would come into his life and that this would be good. He continued to stay in Nepal on into 1978 in order to attend a new series of empowerments in the Chokling Tersar cycle given by His Holiness Dilgo Khyentse Rinpoche. It was while attending one of these empowerments, that a Western woman, Jane Dedman (later to become Chagdud Khadro), approached Chagdud Rinpoche with the offering of a white scarf and a jar of honey. Afterwards he invited her to lunch, and shortly after this he gave her some teachings. A month or so later he accepted her offer to serve as his attendant in retreat after the empowerments. This retreat lasted for several months, after which Dudjom Rinpoche among other things suggested Chagdud go to America to teach. After many months of waiting he was finally granted a visa and landed in San Francisco on Oct. 24, 1979. Shortly after this, he married Jane in South Lake Tahoe, California. The early years of his teaching in the Americas was spent in Eugene, and Cottage Grove, Oregon. In 1983, at the request of his students, he established Chagdud Gonpa Foundation. He soon ordained his first lama, a Western woman named Inge Sandvoss, as Lama Yeshe Zangmo. Additionally in the time period of 1980 through 1987 he traveled widely and gave many teachings, accompanied by his translator, Tsering Everest. He invited many other renowned Lamas such as Dudjom Rinpoche, Tulku Urgyen Rinpoche, Kalu Rinpoche, and Kyabje Penor Rinpoche to Oregon where they bestowed many empowerments and teachings. He also helped set up Padma Publishing which eventually published his two books: The Lord of the Dance, and Gates to Buddhist Practice. With the assistance of Richard Barron, Padma Publishing also began the monumental task of translating from Tibetan into English, Longchenpa's Seven Treasuries, of which four volumes have been published to date. In 1987 he returned to Tibet for the first time since 1959. He traveled to Kham, visiting the three monasteries of his youth, and actually bestowed empowerments to the monastic staff there. His son, Jigme Tromge Rinpoche, traveled with him to Tibet and the next year immigrated to the United States, entering a three year retreat a few months after his arrival. Then in 1988 after land was acquired in the Trinity Alps of Northern California, the main seat of Chagdud Gonpa Foundation was created there as Rigdzin Ling. 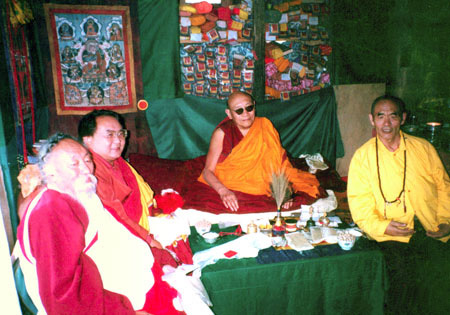 Chagdud Tulku Rinpoche, Sogyal Rinpoche, Trulshik Rinpoche and Nyoshul Khenpo in Maratika cave, 1991. It was here that Chagdud Tulku offered the empowerments and oral transmissions of the Dudjom Treasures in 1991, and several years later, of the supreme Dzogchen cycle, Nyingtik Yabshyi. In 1992 he received an invitation to teach in Brazil and he would become a pioneer insofar as spreading the Dharma in South America. Throughout the 1990s he maintained an extensive teaching schedule, put many of his senior students into three year retreats, and helped to establish many Chagdud Gonpa centers throughout the Western Hemisphere. These include, more than 38 Dharma centers under Chagdud Tulku's supervision and inspiration, in America, Brazil, Chile, Uruguay, Switzerland and Australia. The best known are Rigdzin Ling in Junction City, California and Khadro Ling, his main center in Três Coroas, Brazil. In this context ‘pure motivation’ means the cultivation of bodhichitta, which is the enlightened intent of doing practice for the benefit of oneself, and all other sentient beings. In 1995 he moved to Khadro Ling, in Río Grande do Sul, Brazil, and it became the main seat of his Dharmic activities, for the rest of his life. In 1996 the first Brazilian Dzogchen retreat took place at Khadro Ling and a large Guru Rinpoche statue was created there. In the next few years, he traveled in South America, giving teachings in Uruguay, Argentina, and Chile, in addition to different parts of Brazil. He also continued to travel to his centers in the United States, and made frequent visits to Nepal, a return to Chagdud Gompa in eastern Tibet and a visit to mainland China. During this same time period, in addition to leading drupchens and month long Dzogchen retreats, he also trained his students in the sacred arts of sculpture and painting, as well as ritual dance, chanting, and music. In 1998, construction began on the lha khang (temple) of Khadro Ling. In July 1998, the empowerments of the Taksham Treasures were bestowed by Tertön Namkha Drimé in the still incomplete temple. This temple was followed by an enormous prayer wheel project, perhaps the largest in the Western Hemisphere, then eight magnificent stupas, and a monumental statue of Akshobhya Buddha. In the same period, in Pharping, Nepal, Rinpoche built a new retreat center where eight people began training according to the Katok tradition under Kyabjé Getse Tulku (the fourth incarnation of Gyurme Tsewang Chokdrup). While Chagdud Rinpoche kept up a tremendous amount of Dharmic actvity, in the last few years of his life he was somewhat slowed down by diabetes, and in 1997, he entered a clinic and was diagnosed with a serious heart condition. In the last year of his life Rinpoche's body began to sabotage his outer activities. He tired more easily, and travel became difficult. In 2002, he cancelled a trip to the United States, which had been scheduled for October, and instead entered strict retreat. In the last week of his life, he concluded this retreat on Tuesday, November 12th, worked with a student artist to complete a statue of Amitabha, talked with many of his students, and led a training in phowa (transference of consciousness at the moment of death) for more than two hundred people. He continued teaching with great vigor until about 9 pm on Saturday night November 16th. Then on Sunday morning of the 17th, at about 4:15 am, Brazilian daylight time, he suffered massive heart failure while sitting up in bed. “After his last breath, my father remained in a state of meditation for almost six full days that prevented the usual deterioration of his body. The ability to remain in a state of meditation after the breath stops is well known among great Tibetan masters, but circumstances have rarely allowed it to occur in the West. Chagdud Rinpoche remained sitting in a natural, lifelike meditation posture, with little visible change of color or expression. During that time, no one touched his body. Afterwards his kudung (the physical body) was flown to Kathmandu, Nepal, and then to the retreat center in Pharping. During the forty-nine days that followed, Getse Tulku Rinpoche and Jigme Tromge Rinpoche led ceremonies in Pharping, to purify inauspicious circumstances to Rinpoche's rebirth and to generate great merit through offerings and practice. A year later on the full moon of December 8, 2003, Rinpoche's cremation was held on Jigme Rinpoche's land in Pharping, with Katok Moktsa Rinpoche, one of the highest lamas of Katok Gompa, serving as vajra master. Hundreds of Rinpoche's students gathered, to mourn the loss of his direct physical presence, and made prayers and offerings for his eventual rebirth. His principal successors, Lama Drimed Norbu, his wife Chagdud Khadro and his son Jigme Tromge Rinpoche continue to teach and carry on Chagdud Rinpoche's many projects and practices. In 2010, Jigme Tromge Rinpoche announced that the tulku of Chagdud Tulku Rinpoche had been recognized by Khenpo Ngagchung of Nyoshul Gonpa in Tibet. This page was last edited on 30 November 2017, at 15:11.